"We Now Bring You This Discussion, Already in Progress"
The first panel I podcast will not be the first panel I recorded, or attended. We're going to start with the Friday 10 AM Panel from the world fantasy convention. I was still getting my routine in place, and thus you're going to hear it a bit after it began. Not to worry, there's a lot of meat in this one about a great theme—how mystery works in speculative fiction, because in any speculative work you've just got to wonder — why is this not the world we know? Here's what the WFC flyer had to say ... In both the ghost story and in modern urban fantasy there is the potential for a central mystery that must be solved and the denouement of which is the climax of the story. Is this element critical for a successful work or is merely the icing on the cake? What are some of the outstanding examples of this and what are some examples of works that were not successful because they missed this mark? Daniel Paul Olson (moderator), J. Kathleen Cheney, Laura Anne Gilman, Thomas S. Roche, Chelsea Quinn Yarbro I'll add that Daniel Paul Olson was an outstanding, even eloquent moderator. The participants were all up to his level, and the subject is of core interest to readers in the genre and a decent way for readers out of the genre to get a feel for what the genre has to offer. You can find out what the panel had to offer by following this link to the MP3 audio file. "Even knowing how the ending comes out, at least in our temporality..."
It is always pleasure to talk to Kim Stanley Robinson — he's so full of great ideas and has such an enjoyable hold on the world that you just can't go wrong. But when he's got a nice reprint of a time-altering story from more than 20 years ago to pair up with his latest fat novel of time travel, it's more fun than a house of mirrors. 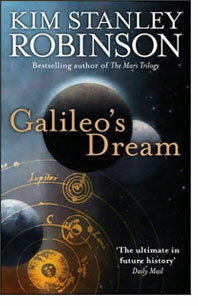 Robinson's an authority at creating literary mirrors, and one of the things he says in this interview struck me as being a fabulous truth that can go along with his now famous quote — "We're living in a bad science fiction novel." As we talked about time travel and alternate history novels and the bloom of them in the 1940's and 1950's, he said that these novels of time travel were a metaphor for, a means of commenting on, the writing and revision of actual history. I'd never twigged to that, more fool me, but Robinson's always good for some utterly insightful remark, generally thrown away as an aside. There are more in the alas-brief interview you can find via this link to the MP3 audio file. "It is chaotic and wild and crazy." Readers will know by now that I was quite impressed with Eric Simons even before I talked to him. He'd read one hell of great bit out of a book that sounded quite entertaining. It should have been an easy interview. In point of fact, I could not have anticipated how easy and entertaining the interview would be. Simons has a great shtick, and he speaks amazingly well off-the-cuff. 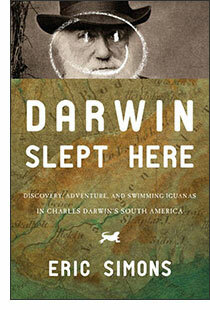 We talked about how and why he came to write 'Darwin Slept Here' and about his experiences in South American, following in the footsteps of Darwin. It was the kind of interview that made me hope that he'd take another trip and pronto. It was the kind of interview that absolutely sold me a book that has proved to be as entertaining as the writer. And here's a link to the MP3 audio file so that in a mere nine minutes, you can figure out just why you want to read about how bored Darwin was in Patagonia — and why. "That seems to me, totally wrong." Yes, I have a lot of catching up to do. And so we forge forward, with this podcast of a fabulous panel from October's SF in SF, featuring Eric Simons, Kim Stanley Robinson and Terry Bisson. This was SF in SF's first experiment that I know featuring a non-fiction writer, and it is one I hope that they shall repeat. You know that you’re going to have a lot of fun when you put Kim Stanley Robinson on a panel, because, he's well — known to be witty and funny and very insightful. Eric Simons was an unknown, until her read, at which point he was revealed to be a perfect match for Robinson. Add in the ever-sharp Terry Bisson, a smattering of house commenters and a great, controversial subject, that being Evolution and Charles "Changed the World" Darwin — and you are guaranteed a good time whether you're there (which is always better because you can sip fine whiskey while participating) or whether you’re listening on your way into work via this linked MP3 audio file. "I started out knowing one thing: my main character was somehow going to become a zombie." OK, I was horrified. Or at least, a little shocked. As well, as, admittedly, charmed by the result. 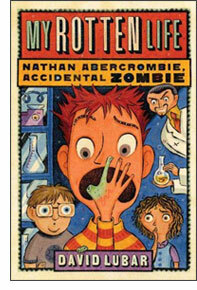 When I first saw 'My Rotten Life' by David Lubar, I thought, "Oh my...zombies for eight year-olds? What sort of fellow writes that?" 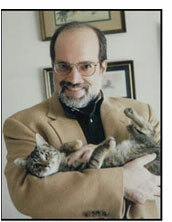 The same sort of fellow, it happens, who writes the many "Weenies" books. David Lubar is smart, a pragmatic, and a skilled, dedicated writer who knows his audience and knows how to write the right zombie books for pre-teens. I really didn't know what to expect when I talked to Lubar. After all, I saw the Weenies books and, uh ... I thought they were about like, little hot dogs with legs, kinda like, I don’t know, Garbage Patch Kids? Well, turns out they're about the people who are so obsessed with something — say their lawn — that we call them lawn weenies — or Lubar does at least. You want to hear a consummate craftsman speak, listen to Lubar. He's a guy who will spend hours laboring over a single word, and lots of time reading at schools and talking to kids who may one day supplant him. But I don’t think that's going to happen any time soon. When I talked to him, all I had was an ARC of 'My Rotten Life,' but he was talking about how the series (yes, it’s a series) started out as a trilogy and is now five books. I think he's already on book four. You can hear what a leading and entertaining writer of children's fiction has to about the craft and the biz of writing by following this link to the MP3 audio file.